The American Board of Commissioners for Foreign Missions had its beginning in the revivals at the end of the eighteenth, and the beginning of the nineteenth century. Click HERE for an Expanded View of the ABCFM. During the latter part of the eighteenth and the early part of the nineteenth century several missionary societies were formed in the United States. He found the town and college under the influence of a great revival. Though felt but slightly in the college in 1805, in the summer of 1806 it was profoundly stirring men’s souls. Prayer-meetings by groups of students were being maintained zealously. On a Saturday afternoon in August, 1806, five Williams College students, Congregationalists in background, gathered in a field to discuss the spiritual needs of those living in Asian countries. The five who attended were Samuel J. Mills, James Richards, Francis L. Robbins, Harvey Loomis, and Byram Green. The meeting was interrupted by the approaching storm. It began to rain; the thunder rolled with deafening sound familiar to those who dwell among the hills; the sharp quick flashes of lightning seemed like snapping whips driving the men to shelter. They crouched beside a large haystack which stood on the spot now marked by the Missionary Monument. Here, partially protected at least from the storm, they conversed on large themes. The topic that engaged their interest was Asia. The work of the East India Company, with which they were all somewhat acquainted, naturally turned their thoughts to the people with which this company sought trade. All but Loomis responded to this inspiration of Mills. Loomis contended that the East must first be civilized before the work of the missionary could begin. The others contended that God would cooperate with all who did their part, for He would that all men should be partakers of the salvation of Christ. The students were also influenced by a pamphlet titled ‘An Inquiry into the Obligation of Christians to use means for the Conversion of the Heathen,’ written by British Baptist missionary William Carey. Though only two of the five Williams students at the Haystack Prayer meeting ever left the United States, the impact of their passion for missions is widespread. Samuel Mills became the Haystack person with the greatest influence on the modern mission movement. He played a role in the founding of the American Bible Society and the United Foreign Missionary Society. Upon the enrollment of Mills and Richards at Andover Seminary in 1810, Adoniram Judson from Brown, Samuel Newall from Harvard, and Samuel Nott from Union College joined the Brethren. In June 1810, Mills and James Richards petitioned the General Association of the Congregational Church to establish the foreign missions. American Board of Commissioners for Foreign Missions was formed with a Board of members from Massachusetts and Connecticut. At this same time, in the Islands, a Hawaiian, ʻŌpūkahaʻia, made a life-changing decision – not only which affected his life, but had a profound effect on the future of the Hawaiian Islands. ‘Ōpūkaha’ia swam out to and boarded Brintnall’s ‘Triumph’ in Kealakekua Bay. After travelling to the American North West, then to China, they landed in New York in 1809. They continued to New Haven, Connecticut. ʻŌpūkahaʻia was eager to study and learn – seeking to be a student at Yale. The Mills family invited ʻŌpūkahaʻia into their home. Later Mills brought ʻŌpūkahaʻia to Andover Theological Seminary, the center of foreign mission training in New England. 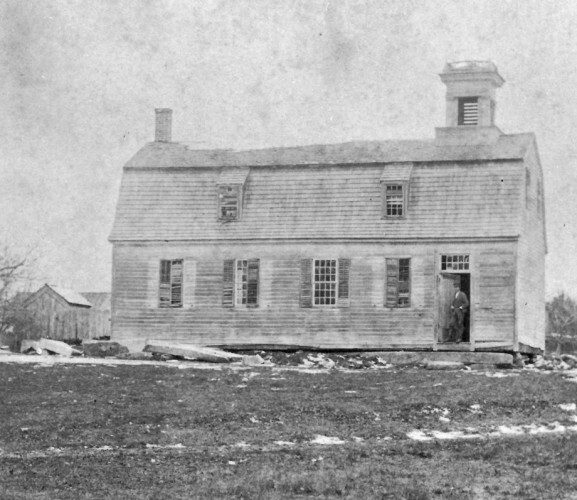 In October, 1816, the American Board of Commissioners for Foreign Missions (ABCFM) decided to establish the Foreign Mission School in Cornwall, Litchfield County, Connecticut, for the instruction of youth like ʻŌpūkahaʻia. By 1817, a dozen students, six of them Hawaiians, were training at the Foreign Mission School to become missionaries to teach the Christian faith to people around the world. Initially lacking a principal, Dwight filled that role from May 1817 – May 1818. ʻŌpūkahaʻia was being groomed to be a key figure in a mission to Hawai‘i, to be joined by Samuel Mills Jr. Unfortunately, ʻŌpūkahaʻia died at Cornwall on February 17, 1818, and several months later Mills died at sea off West Africa after surveying lands that became Liberia. Edwin W Dwight is remembered for putting together a book, ‘Memoirs of Henry Obookiah’ (the spelling of the name based on its pronunciation), as a fundraiser for the Foreign Mission School. It was an edited collection of ʻŌpūkahaʻia’s letters and journals/diaries. The book about his life was printed and circulated after his death, becoming a best-seller of its day. Ōpūkaha’ia, inspired by many young men with proven sincerity and religious fervor of the missionary movement, had wanted to spread the word of Christianity back home in Hawaiʻi; his book inspired missionaries to volunteer to carry his message to the Hawaiian Islands. The coming of Henry ʻŌpūkahaʻia and other young Hawaiians to the US, who awakened a deep Christian sympathy in the churches, moved the ABCFM to establish a mission at the Islands. On October 23, 1819, the Pioneer Company of ABCFM missionaries set sail from Boston on the Thaddeus to establish the Sandwich Islands Mission (now known as Hawai‘i). Over the course of a little over 40-years (1820-1863 – the “Missionary Period”), about 184-men and women in twelve Companies served in Hawaiʻi to carry out the mission of the ABCFM in the Hawaiian Islands. It speaks of ‘Ōpūkaha’ia and his influence in establishing the Hawaiian Islands Mission. Receive yet one, the crown of all the earth. Folks saw a couple options: bring Indian and foreign youth into white communities and teach them there, or go out to them and teach them in their own communities. They chose the former. They formed the Foreign Mission School in Cornwall CT. The school’s first student was Henry ʻŌpūkahaʻia (Obookiah,) a native Hawaiian from the Island of Hawaiʻi who in 1808-1809 (after his parents had been killed) boarded a sailing ship anchored in Kealakekua Bay and sailed to the continent. In its first year, the Foreign Mission School had 12 students, more than half of whom were Hawaiian. At the beginning of the school’s tenure, ‘Ōpūkaha‘ia was considered a leader of the student body, excelling in his studies, expressing his fondness for and understanding of the importance of the agricultural labor, and qualifying for a full church membership due to his devotion to his new faith. ʻŌpūkahaʻia, inspired by many young men with proven sincerity and religious fervor of the missionary movement, had wanted to spread the word of Christianity back home in Hawaiʻi; his book inspired missionaries to volunteer to carry his message to the Hawaiian Islands. Over the course of a little over 40-years (1820-1863 – the “Missionary Period”), about 184-men and women in twelve Companies served in Hawaiʻi to carry out the mission of the American Board of Commissioners for Foreign Missions (ABCFM) in the Hawaiian Islands. On October 29, 1816, the American Board of Commissioners for Foreign Missions (ABCFM) established the Foreign Mission School as a seminary. Its object was to educate the youth of promising talent and of hopeful demeanor to return, in due time, to their respective lands in the character of husbandmen, school-masters, or preachers of the gospel. The Foreign Mission School connects the town of Cornwall, Connecticut to a larger, national religious fervor of the Second Great Awakening. The Second Great Awakening spread from its origins in Connecticut to Williamstown, Massachusetts; enlightenment ideals from France were gradually being countered by an increase in religious fervor, first in the town, and then in Williams College. In the summer of 1806, in a grove of trees, in what was then known as Sloan’s Meadow, Samuel John Mills, James Richards, Francis L Robbins, Harvey Loomis and Byram Green debated the theology of missionary service. Their meeting was interrupted by a thunderstorm and they took shelter under a haystack until the sky cleared. That event has since been referred to as the “Haystack Prayer Meeting” and is viewed by many scholars as the pivotal event for the development of Protestant missions in the subsequent decades and century. The first American student missionary society began in September 1808, when Mills and others called themselves “The Brethren,” whose object was “to effect, in the person of its members, a mission or missions to the heathen.” (Smith) Milla graduated Williams College in 1809 and later Andover Theological Seminary. Cornwall’s Foreign Mission School exemplified evangelical efforts to recruit young men from indigenous cultures around the world, convert them to Christianity, educate them and train them to become preachers, health workers, translators and teachers back in their native lands. Initially lacking a principal, Edwin Welles Dwight filled that role from May 1817 to May 1818; he was replaced the next year by the Reverend Herman Daggett. In its first year, the Foreign Mission School had 12 students, seven Hawaiians, one Hindu, one Bengalese, an Indian and two Anglo-Americans. The school’s first student was Henry ʻŌpūkahaʻia (Obookiah,) a native Hawaiian from the Island of Hawaiʻi who in 1807 (after his parents had been killed) boarded a sailing ship anchored in Kealakekua Bay and sailed to the continent. In its first year, the Foreign Mission School had 12 students, more than half of whom were Hawaiian. The school increased its number of pupils the second year to twenty-four; four Cherokee, two Choctaw, one Abenaki, two Chinese, two Malays, a Bengalese, one Hindu, six Hawaiians and two Marquesans as well as three American. By 1820, Native Americans from six different tribes made up half of the school’s students. Once enrolled, students spent seven hours a day in study. Subjects included chemistry, geography, calculus and theology, as well as Greek, French and Latin. In due time, Reverend Hiram Bingham visited the Foreign Mission School in Cornwall but that wasn’t until May 1819, one year after ʻŌpūkahaʻia died. Subsequently, in the summer of 1819, Bingham and his classmate at Andover Theological Seminary, Reverend Asa Thurston, volunteered to go with the first group of missionaries to Hawai‘i. There are three prominent names associated with the history of Missions in America, Eliot of the 17th century, Brainerd of the 18th century and Mills of the 19th century. David Brainerd (April 20, 1718–October 9, 1747) was an American missionary to the Native Americans who had a ministry among the Delaware Indians of New Jersey. Samuel John Mills (1783-1818) was the key instigator of American foreign missions. He grew up in Torringford, Connecticut, where his father, also named Samuel John Mills (1743-1833,) was pastor of the Congregational Church. In the early-1800s, the US was swept by religious revivalism and many people were converted in the wake of the newly born religious fervor. The Second Great Awakening spread from its origins in Connecticut to Williamstown, Massachusetts; enlightenment ideals from France were gradually being countered by an increase in religious fervor, first in the town, and then in Williams College. In 1806, Mills headed off to Williams College in Massachusetts; he shared his thoughts on a missionary life with a few friends at college. In the summer of 1806, in a grove of trees, in what was then known as Sloan’s Meadow, Mills, James Richards, Francis L Robbins, Harvey Loomis and Byram Green debated the theology of missionary service. Their meeting was interrupted by a thunderstorm and they took shelter under a haystack until the sky cleared. The first American student missionary society began in September 1808, when Mills and others called themselves “The Brethren,” whose object was “to effect, in the person of its members, a mission or missions to the heathen.” (Smith) Mill graduated Williams College in 1809 and later Andover Theological Seminary. In 1818, following a brief stay in England, Mills sailed to the west coast of Africa to purchase land for the American Colonization Society, then embarked for the United States on May 22 – he died at sea on June 16, 1818. The story of the Foreign Mission School (1817-1826) connects the town of Cornwall, Connecticut, to a larger, national religious fervor of the Second Great Awakening. Cornwall’s Foreign Mission School exemplified evangelical efforts to recruit young men from indigenous cultures around the world, convert them to Christianity, educate them, and train them to become preachers, health workers, translators and teachers back in their native lands. The school’s first student was Henry ʻŌpūkahaʻia (Obookiah,) a native Hawaiian from the Island of Hawaiʻi who in 1809 (at the age of 16, after his parents had been killed) boarded a sailing ship anchored in Kealakekua Bay and sailed to the continent. In its first year, the Foreign Mission School had 12 students, more than half of whom were Hawaiian. The next year, the enrollment doubled to 24 and, in addition to Chinese, Hindu and Bengali students, also consisted of seven Native Americans of Choctaw, Abnaki and Cherokee descent. By 1820, Native Americans from six different tribes made up half of the school’s students. Once enrolled, students spent seven hours a day in study. Subjects included chemistry, geography, calculus and theology, as well as Greek, French and Latin. They were also taught special skills like coopering (the making of barrels and other storage casks), blacksmithing, navigation and surveying. When not in class, students attended mandatory church and prayer sessions and also worked on making improvements to the school’s lands. ʻŌpūkahaʻia died suddenly of typhus fever in 1818; the “Memoirs of Henry Obookiah” served as an inspiration for missionaries to volunteer to carry his message to the Sandwich Islands. Over the course of a little over 40-years (1820-1863) (the “Missionary Period”,) about 180-men and women in twelve Companies served in Hawaiʻi to carry out the mission of the ABCFM in the Hawaiian Islands. Today, the Hawaiian Mission Children’s Society, a nonprofit educational institution and genealogical society, exists to promote an understanding of the social history of nineteenth-century Hawai‘i and its critical role in the formation of modern Hawai‘i. The Society operates the Hawaiian Mission Houses Historic Site and Archives, comprised of three historic buildings and a research archives with reading room. The Society also compiles the genealogical records of the American Protestant missionaries in Hawai‘i and promotes the participation of missionary descendants in the Society’s activities. Through the Site and Archives, the Society collects and preserves the documents, artifacts and other records of the missionaries in Hawai‘i’s history; makes these collections available for research and educational purposes; and interprets the historic site and collections to reflect the social history of nineteenth century Hawai‘i and America. The image shows the Foreign Mission School in Cornwall, Connecticut. In addition, I have added other related images in a folder of like name in the Photos section on my Facebook and Google+ pages. How did the daughter of a teacher to Henry ʻŌpūkahaʻia, niece of the founder of the American Board of Commissioners for Foreign Missions, wife of a prominent preacher in Honolulu and mother of a successful Honolulu businessman die in Wyoming? Before we go there, here is some of her background. We should also recall that Henry ʻŌpūkahaʻia (Obookiah,) a native Hawaiian from the Island of Hawaiʻi who in 1809, at the age of 16, after his parents had been killed, boarded a sailing ship anchored in Kealakekua Bay and sailed to the continent. He traveled throughout New England and was greatly influenced by many young men who were active in the Second Great Awakening and the establishment of the missionary movement. Julia was orphaned of both parents, at the age of fourteen. On October 16, 1841, Julia Sherman Mills married Samuel Chenery Damon. The Damons sailed from New York March 10, 1842 aboard the Victoria and arrived in Honolulu October 19, 1842. About Julia’s death … she was widowed on February 7, 1885. A lot is written of Julia’s husband’s (Samuel Chenery Damon) life and accomplishments (as well as her children, including businessman Samuel Mills Damon.) In fact, it is not too late to take part in the Hawaiian Mission Houses Historic Site and Archives Cemetery Pupu Theatre to learn about her husband Samuel Chenery Damon. David C Farmer portrays Reverend Damon at the grave sites of Samuel and Julia in Oʻahu Cemetery. A little side note; in 1843, Samuel Chenery Damon founded The Friend and served as editor and publisher of the monthly journal, which continued to be published for more than 100 years. The Friend began as a monthly newspaper for seamen, which included news from both American and English newspapers, and gradually expanded to adding announcements of upcoming events, reprints of sermons, poetry, local news, editorials, ship arrivals and departures and a listing of marriages and deaths. Rev. Damon published between a half million and a million copies of The Friend, most of which he personally distributed. Because of its longevity, The Friend is an excellent resource for scholars of nineteenth-century Hawaiian history. Mission Houses makes digital copies of the Friend available on-line for review. Here’s the link to The Friend. This collection contains 1,396 issues comprising 21,030 pages and 50,904 articles. A lot of information here is from The Friend, including Julia’s obituary. Back to Cemetery Pupu Theatre … there are only two performances left to choose from: Performance dates are: Friday and Saturday, June 21 and 22; Pupu: 5 pm – Performance: 6 pm; $45 per person – includes drinks and pupu, seating limited, RSVP required. 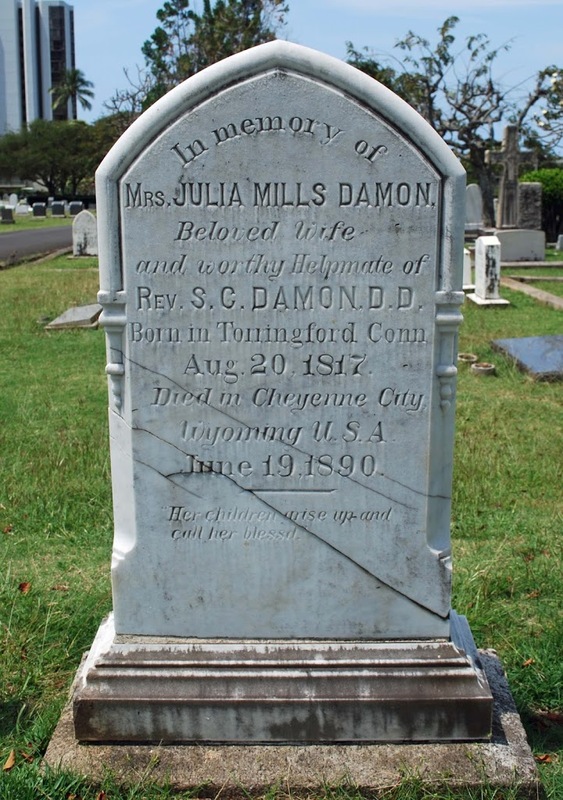 The image shows the headstone of Julia Sherman Mills Damon at Oahu Cemetery. In addition, I have added other related images in a folder of like name in the Photos section on my Facebook and Google+ pages.